This article focuses on how children's rights in society can be manifested with cultural tools and through cultural participation. The article discusses cultural participation for, with and by children based on the core ideas of a Swedish governmentally initiated strategy implemented in the 1970s. The right for children to take part in cultural activities, to be culturally active and to express themselves is based on the UN Convention on the Rights of the Child (1989). Art education and visual activities for children in formal and informal cultural environments and the use of contemporary art will be discussed. An art-based project in collaboration between a cultural institution and preschool and younger children is described. The main purpose of the article is to analyse what impact the use of cultural participation and cultural tools has on children's collective experience and learning, as well as to discuss and contextualise the relationship between culture, preschool and school as it is influenced by global and societal changes, particularly the increasing visual impact in society through the use of digital media and multimodality. 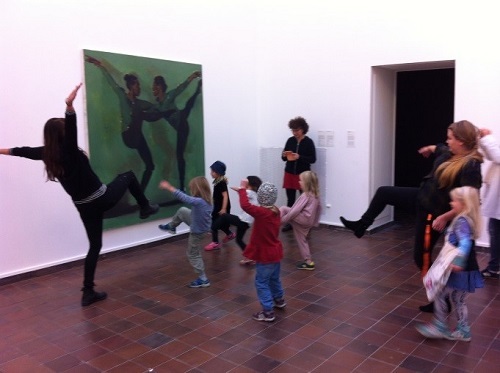 The results show how an art gallery visit and the use of cultural narratives, such as art educational activities at a preschool based on work with a picture book, create visual knowledge and contribute to children’s agency and understanding of equity as one of the aims in the early childhood education curriculum. Tarja Karlsson Häikiö has a PhD in Art History and Visual Studies, and is Associate Professor in Visual and Material Culture, Academy of Design and Crafts at the University of Gothenburg. Her research areas are visual art education, child and youth culture, aesthetic learning, art pedagogy, documentation and assessment as well as different kinds of artistic practices related to teaching and learning. She has published scientific articles and contributed to several anthologies in the field of early childhood and visual art education in preschool and compulsory school..